Hello, and welcome back to our blog here at Jay Mechanical. This is part two of our blog series about making the most of the air conditioner within your home. If your recall from last time, we covered several topics including your thermostat and your air filters. This time, we’ll cover several more things you may not have thought about. If you’re ready to speak with a specialist about repairing, replacing, or installing an air conditioner unit in Essex, don’t hesitate to call the experts at Jay Mechanical. All of our employees are certified HVAC specialists, not subcontractors. Before being hired, all of our employees must meet our heating and air conditioning service quality standards and our lead technicians who train them have 15 years of experience in the HVAC industry. All of our employees are certified HVAC specialists, not subcontractors. Sometimes it’s good to get into the habit of checking your actual AC unit itself. Although you won’t be able to tell if there are any internal issues without the help of an HVAC specialist, you should be able to tell if there’s any physical damage to the exterior of the unit. It’s generally best if there’s some shade covering the AC unit. The drain line is typically mounted close to the AC unit. You’re looking for a piece of PVC or a pipe of some sort. Inspect around the unit for leaks or cracks and speak with your AC specialist about potentially flushing the line in order to keep the line clear. Another thing that can go wrong with an air conditioner is that the ducts are worn, cracked, or have holes in them. When this happens, you’ll be left with an air conditioner unit that either is wasting a significant amount of energy or that doesn’t even start up. Although you can do this by yourself, it’s recommended that you call an HVAC specialist who will know exactly what to look for on the inside and the outside of the ducts. Air vents are another part of your air conditioner that you should inspect. Start by walking around the perimeter of your home and look at the air vents in the ceiling, floor, or wherever they are within your home. Make sure they aren’t closed and if they are, be sure to open them up. Secondly, you should remove the cover and look for dust or other debris that could be blocking the air flow. Your HVAC systems need to have functioning electrical circuits in order to boot up and run. If your system isn’t working and you can’t figure out why, there may be an electrical wiring issue that causes miscommunication between your system and your thermostat. If this is the case you will almost certainly need the help of an HVAC specialist. If you have any questions about this process, speak with an HVAC technician at Jay Mechanical. These are just a few of the things you can be doing to get the most out of your air conditioner. 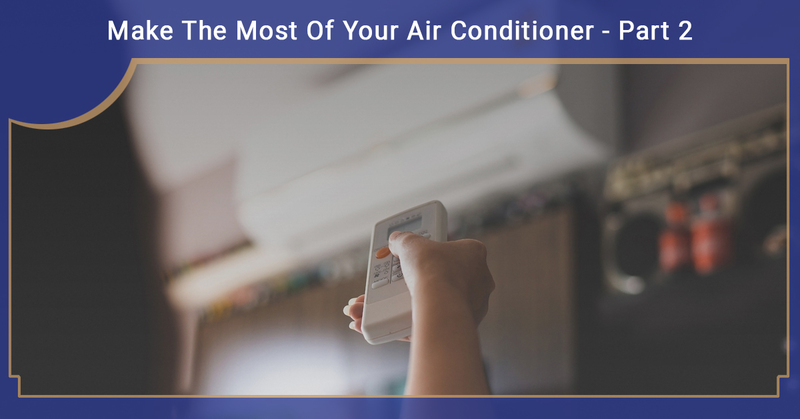 Be sure to stay tuned to our next blog in the series to learn about several more ways you can get the most out of your air conditioner. In the meantime, if you’d like to speak with a certified air conditioner repair specialist in Essex, don’t hesitate to contact Jay Mechanical. With 15 years of experience in the industry we are more than qualified to help you with AC repairs, replacement, or installation.